When my children were born I learned to cook with meat. I came from several generations of vegetarians, and wanted my kids to have a choice, moral and otherwise, about what they ate. I’m not squeamish and I love to cook, so I started pestering my friends for their favourite carnivore recipes. “It’ll be great,” they said. “It’ll be so easy,” they said. This was 30 years ago, so no Internet, and we lived in the wilderness. You had to figure stuff out on your own. Determined to turn this massive dead creature into food for my family, I marched into the house to get a knife to cut off the head and the tail, and to carve it into steaks to put in the freezer. Already imagining how I’d cook my first salmon steak (I’ll bet it would be good rolled in seasoned flour with garlic, butter, dill, and lemon) I knelt over the fish and started sawing on its neck. With a steak knife. I had no idea what it would take to cut a fish’s head off. I hacked away to no avail; I tried a bread knife and then a carving knife. There was blood and scales everywhere and the fish looked like it had head-butted a barbed wire fence. Finally, sweaty and frustrated, I stomped out to the shed and came back with a machete. I balanced my enormous pregnant self over that fish and while my toddler watched with bemusement through the screen door, I brought the blade down with a primal yell. I was determined that my children not be raised believing that meat came from little Styrofoam packages from the grocery store. If they were going to eat meat, I wanted them to know where it came from. I took them to butcher chickens at a neighbour’s farm. They caught and gutted fish, helped butcher a deer, and they even ate bear stew once for Thanksgiving dinner. Boy, did I learn a lot. I learned that if you cook the hamburger ahead of time and then try to shape it into patties it looks like road kill and you have to improvise it into Sloppy Joes in a flying hurry before your company arrives for dinner. I learned that there are chicken breasts with bones and chicken breasts without bones, and if you accidently get boned ones for making chicken cordon bleu, you’ll end up sweating and cussing while trying to roll them up and all the toothpicks you use to hold them in clumsy cylindrical shapes will eventually pop out and start on fire in the bottom of the oven. 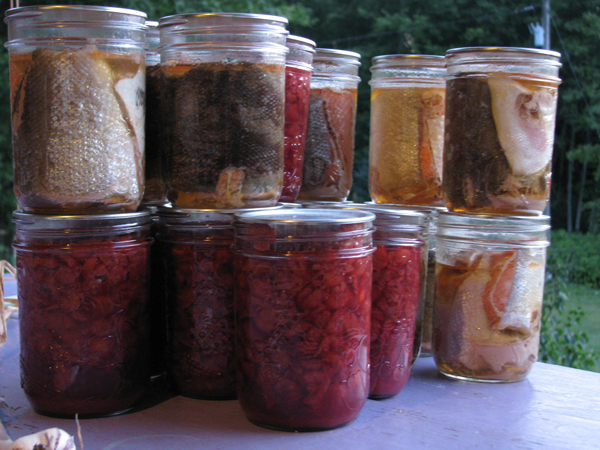 I’ll bet you I canned a thousand jars of salmon when my kids were little. They used to eat home-canned salmon as a snack, in sandwiches, and often took it for school lunches and on camping trips. I also canned lots of fruit and veggies from the garden every year and they grew up eating green beans, beets, applesauce, cherries, pickles, and corn from jars all winter, as well as sauerkraut cured in a big porcelain crock. All my kids can cook; they all like whole, natural foods and care about where it comes from. As teenagers they thought it was amusing and vaguely pathological that I spent so much time and effort preparing food I never ate, but as adults they’ve thanked me for making the choice to give them a choice. They still love anything I home-can and recently I traded my youngest son a jar of pickled beets from my garden for pairing my cordless keyboard to my phone. And, by the way, everybody said those salmon steaks were great. Even with the slightly raggedy edges. LeRae Haynes is a freelance writer, songwriter, co-producer of “Pursicles,” and the community co-ordinator for Success by 6. She is also the instigator of a lot of musical shenanigans in Williams Lake including “Borderband” with kids and is a member of the “Perfect Match” dance band.